These have been amazing to read and look at. 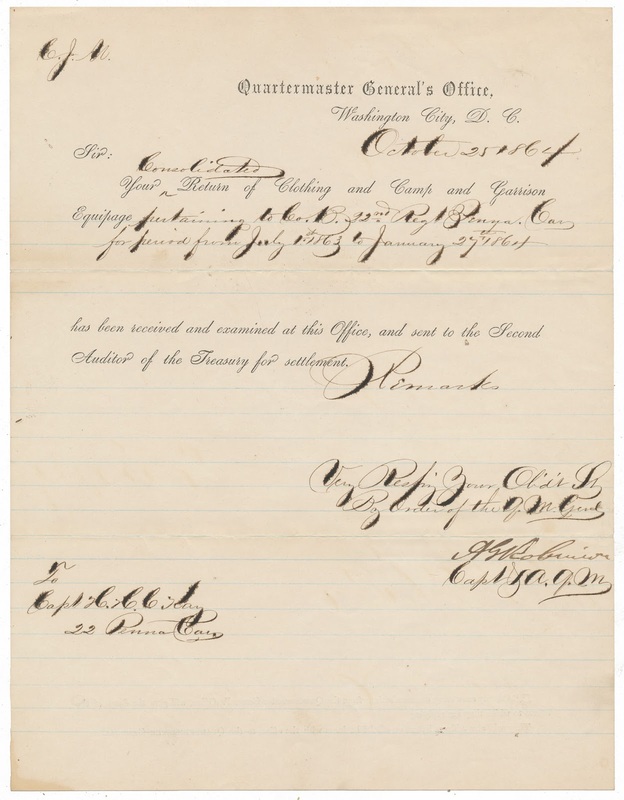 I love reading and seeing Civil War correspondence and paperwork. Henry C. H. Kay was commissioned into Company B of the 22nd Pennsylvania Cavalry on July 17th, 1863. He was from Blair County, Pennsylvania. He had previously served in the 110th Pennsylvania Infantry, rising to the rank of 1st Lieutenant. The 22nd Pennsylvania Cavalry is one of the odd Pennsylvania units which was converted over into infantry later in the war (as the 185th Infantry). According to the muster rolls, he was under arrest when the regiment was mustered out of service. That's a tantalizing detail, eh? Where you've transcribed "Gar." it likely says "Cav."